Are you in the market for a new or used car? To ensure you make a smart purchase, here are six rookie mistakes to avoid at the dealership. Too often, rookie car buyers make the mistake of going to the dealership, without having done their research first. Whether you're shopping for a new or used car, you should begin your search well before visiting the dealership. Do your due diligence by searching the online inventories of various car dealers in NJ, as well as looking at Kelley Blue Book and Edmunds guides. This will tell you show you what's out there and allow you to compare costs and features. Along with surveying the options, consider the type of car you're after. By knowing what type of car you require, you'll avoid choosing a car that's ill-suited for your needs. Learn about the different makes and models of various vehicles to determine which is best for you. Then write down a list of specific vehicles that meet your budget, needs and lifestyle and ask to see them specifically when you're at the dealership. Many rookie buyers head to the dealership without securing financing first. They assume they will finance through the dealership. While financing through the dealership can be the better option, it's still best to line up your own financing first. Before you shop, get pre-approved for a car loan from your bank or credit union. If the dealer can match the interest rate, then you can choose to go through the dealership. If not, you have a lower rate locked in. Having something to compare against the dealer's offering can also help you get the best offer, as well as help you understand how much you can really afford. While buyers need to know how much they can afford for a monthly car payment, this number shouldn't be the only deciding factor when purchasing a car. Buyers should consider the overall cost of car ownership, instead of focusing solely on the monthly payment. Buyers who zone in on the monthly payment make the mistake of paying more in the long run. They settle for a longer finance period to lower the monthly payment, resulting in more interest. When budgeting for a car, also consider the cost of insurance and maintenance. Keep in mind older vehicles will cost a lot more to maintain. There are plenty of car dealers in NJ, so make sure you shop around. If a dealer feels untrustworthy and gives you a weird vibe, simply walk away. There's also no shame in speaking to a manager or another sales representative if you feel a particular salesman is pressuring you into a sale that you're not comfortable with. Make sure you are shopping at car dealers that are reputable and have a good standing with the Better Business Bureau. Research shows that nearly 20% of car buyers skip the test drive before purchasing a new car. Another 33% of car buyers only take a car for a short 10-minute drive around the block before buying. Even with new cars, the test drive is essential. You can’t just go off of what you've heard about a particular car. The test drive is the only real way to determine if it's right for you. Make sure you do a thorough test drive; don't just take a short a spin around the block. If possible, drive the car on a variety of road conditions and try to mirror your daily driving habits. For instance, if you often drive on fast highways, then test the car on a fast road. If you drive frequently on uneven backroads, then drive the car on a bumpy road. During the test drive, consider all aspects of the car, including the comfort, ride, noise, controls, sound system, heating and cooling system, brakes, steering, and so on. If you have your heart set on a specific make and model, consider test driving a competitor vehicle to ensure it suits your preferences. 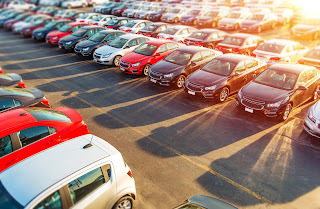 When shopping for a new car, many buyers plan to trade in their current vehicle. If you plan to do this, then do an appraisal on your car beforehand so you know how much it's worth. It's best to leave your car as is because repairs will do very little to increase its value. Refer to Kelley Blue Book and Edmunds guides for the value of your trade-in. By being an educated buyer and avoiding these rookie mistakes, you'll choose with the right vehicle and have a positive car buying experience.